Is Google+ the best place to share and edit pics online yet? Google's attempts to make Google+ the number one destination for users to share their photos continued this weekend with the addition of some new, neat features. 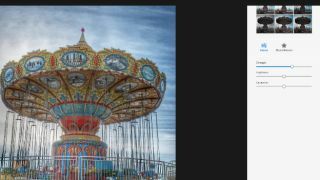 The web giant has added HDR Scape, which allows users to tweak photos with a single-click High Dynamic Range effect, a tool Google has brought over from the Snapseed app it purchased in 2012. There's also a somewhat self-explanatory Zoom editing tool, which is ideal for those seeking to get a better look at elements of the massive high-res photos Google+ allows, and make detailed alterations. "Seeing your images up close is an important part of the editing process — from checking the focus point, to seeing how the "Drama" filter has changed your pixels. With today's update, you can now use the magnifying glass to zoom in or out," wrote Google's Andre Meyer on his own Google+ page. The additions are the latest in a long-line of improvements Google has added to photo uploads and editing within it's social network. Last March it introduced filters to the iOS and Android apps, while in May it added Auto Enhance to liven up dull photos, and Highlights to showcase what it believes are your best photos in any album. In October it also added the Auto Awesome feature which creates a gif-like clip from a series of photos, while just before Christmas it allowed users to add a neat snow effect to wintry pictures. Meyer said the features will be rolling out gradually to Google+ users, so keep an eye out, pop pickers.